To many, the ‘original sin’ of Australian trade unions was its support for the White Australia Policy. Yet despite the White Australia Policy, the story of Chinese workers and Australian unions is far more complex. Contrary to the cultivated image of compliance and exploitation, Chinese workers in Australia understood the importance of collective action and solidarity. In both Sydney and Melbourne, Chinese furniture workers, excluded from union membership, formed their own unions and took industrial action to fight for better wages and conditions. The Melbourne Chinese furniture workers union was formed in the 1880s and strongly fought for their members, waging major strikes. In September 1885, about 300 Chinese workers went on strike to fight for a weekly wage instead of being paid by piece work. By 1888, they had won a minimum wage, a fifty hour week, holidays and union preference. Union activity continued into the next decade. In May 1897, hundreds of Chinese workers took strike action after employers sought to dismiss workers who (in their view) did not warrant new pay rates under the amended Factories Act. The strength of the union was such that in September 1903, several hundred took co-ordinated industrial action for better pay and conditions. The strike lasted for nearly three months, shutting down the industry. In Sydney, Chinese workers formed their own union in 1890. The “Sai-ga-Hong” (西家行), as the 400 member strong union was named, called a strike in 1908 in response to factory owners attempting to make workers pay more for accommodation and food. They held out for two months, winning the right to elect their own foremen. Despite the exclusion they experienced from the wider union movement, Chinese furniture workers understood the importance of solidarity and collective action. During the 1890 maritime strike, in Melbourne, they organised a donation for the strikers and, in Sydney, they (unsuccessfully) tried to affiliated with the Trades and Labour Council in 1908. This forgotten aspect of labour history is not a phenomenon restricted to Australia. In Canada, Chinese workers formed their own unions and tried to affiliate with local trades and labour councils. In America, Chinese railroad workers were engaged in a huge strike as the transcontinental railway was being built and Chinese garment workers in San Francisco and New York City engaged in industrial action. Challenging claims about language and culture being barriers to unionisation, it shows there is a universal understanding of the need to come together to achieve change in the workplace. The Chinese Association and Chinese National Alliance were not entirely successful in mediating conflict within Melbourne’s Chinese community and this damaged its capacity to cooperate on important issues.85 The failure of leadership demonstrated by these outbreaks of violence in the Melbourne Chinese community was related to the changing character of the community, as well as to specific charges bearing on gambling and opium. More and more Chinese furniture factories were being located in the metropolitan areas (Yong 1977:41). Workers employed at these factories, apparently dissatisfied with the ineffectiveness of the Siyi and Kong Chew Societies to represent them in the struggle against anti-Chinese legislation, set up a number of labour guilds to represent their interests more effectively. The ‘Chinese Carpenters Union’ was formed through the merger of two existing guilds—the Chinese Furniture Employers’ Union and Chinese Furniture Employees’ Union. In 1905 a new alliance was forged by Chinese cabinetmakers, fruit traders, journalists and missionaries. Christian faith was the foundation of this alliance. NCEA was supported by members of Chinese Christian Union of Victoria and Chinese Times. Furthermore, the introduction of the legislation led to the formation of a union of Chinese carpenters and laundrymen between 1905 and 1907, which staged public meetings and raised the profile of the the leaders of the Chinese carpenters.86 The secretary of the Chinese Furniture Employees’ Union, Harry Louey Pang (雷鵬 Lei Peng, 1873–1937), claimed that his union had 600 members. By 1906 it had 900 members on the books (Nam 1906). The Federated Furnishing Trade Societies of Aust - Employment of Chinese in Furnishing Trade. 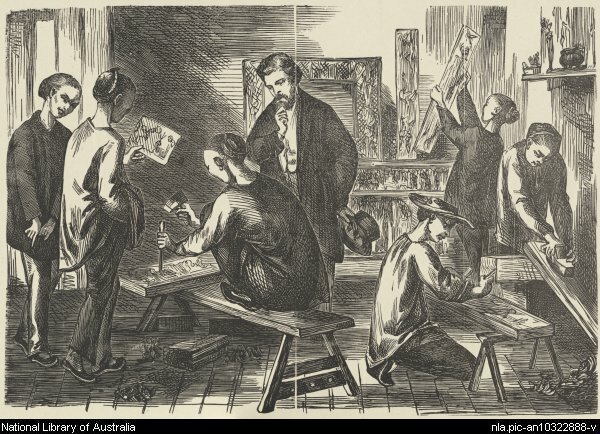 "This is a black-and-white print that shows a group of Chinese carpenters in a workshop at Emerald Hill (South Melbourne) around 1867. A European man, who may be an artist, observes two of the carpenters at work. The carpenters appear to be making celestial carvings, which were spiritual objects for the Chinese, but which may have been used decoratively by European Australians. Various objects and carvings are stacked against the rear wall of the workshop. This print was taken from a wood engraving made by Frederick Grosse that was published in the 'Illustrated Australian News for Home Readers' in March, 1867." Meu Loong was a furniture manufacturer at 38-40 Lonsdale Street, Melbourne, trading as Quong Lee & Co**. Pictured here in 19XX. He emigrated when he was 22, and married another Cantonese migrant Yiet Kai, who had arrived in the colony with her parents as an eleven year old. They had 4 children here before visitingthe family village in Leong Shan, Canton in 1916, intending to return. A doctor's certificate was sent to Customs from China declaring the name and birth of their 5th child, as required by the Immigration Restriction Act. Despite extending their return certificate to 1925, it lapsed when they remained in Canton. **previously 16 Corr's Lane, - 17 Market Lane, Melbourne. LIST of Chinese Factories registered for 1887. Kum Chung Sing and Co.
25 Furniture Factories, employing 341 hands. How many Chinese are working now as cabinetmakers in the city ?-It is very hard to tell. The last return we have gives 29 factories and 388 employees. Did the Union win at the time of the Chinese strike ?-I think they did, but it took place at the worst time, when the men had no chance to go anywhere else. The employers made the strike for 20 per cent. and most of the men submitted to a reduction of 7 per cent., and the other 5 were thrown out and that is the cause of the small places that have sprung up." The above figures refer only to the European factories. The Department cannot obtain reliable statistics from the Chinese, and it seems somewhat useless to obtain statistics showing that the minimum wage or more is being paid when it is notorious that nearly all the Chinese are working piece-work. The following is an extract from my last report :—I cannot obtain evidence which would justify a prosecution, but many of the Chinese will admit that they are working on piece-work when talking generally, but stoutly deny it when pressed for particulars. The Chinese employers appear to have agreed to say they pay the minimum wage and the employees to say they receive it, whereas, in fact, piece-work is paid. When employers and employees unite to deceive in this way the Department can do nothing to enforce the law. I had to admit the same thing in my last Annual Report, and I see little chance of being able at any time to compel the Chinese to comply unless the interests of the employers and employees can be divided. Probably to secure the sale of their goods the Chinese must be able to manufacture considerably below the Europeans, and to do that they must pay lower rates. I have to admit, as in former years, that I know of no means to compel the Chinese to pay the minimum wage. The effects of such competition is probably shown by the following figures :—In 1899 there were 1,103 males employed in the European furniture factories; in 1900 there were 1,104. In 1899 there were 488 males employed in the Chinese furniture factories; in I900 there were 552. Whilst the number of male employees in the European factories increased only one, the Chinese workers increased 64. These figures were supplied in January, 1900. During the year there was a great improvement in trade in European furniture, but I do not think the significance of the figures quoted is altered, as there was probably a corresponding increase in the Chinese furniture trade. I can only hope the Royal Commission will discover some means of dealing with this very difficult question. There were few complaints from the employees in this trade last year, the majority being paid more than the minimum wage. The wages will be found tabulated in Appendix B. Mr. W. H. Ellis reports :—The furniture trade, which is one of the most important in my district, has shown a marked improvement in all branches to previous years--so much so, that great difficulty has been experienced in obtaining sufficient skilled labour to carry on the business successfully, particularly with regard to upholsterers, who could really commitud their own wages. In spite of the increased activity of trade, and the extra demand for all classes of furniture, the prices obtained have not been in proportion. It is a very difficult matter to raise the prices when once they have gone down. The competition amongst the Chinese themselves is quite as keen as it is between Europeans and Chinese, and I am firmly convinced that the European can never successfully compete against them, for various reasons. The Chinese as a rule take to one particular line of the trade, and make that a speciality, viz.—one firm makes meat safes, another kitchen tables, others small chests of drawers, and so on. In doing this they become very expert, and can turn out these articles mach quicker, and of course cheaper. This class of furniture is mostly in &matt(' with the small furniture dealers, who, since the stamping of furniture came into operation, know exactly where to go and purchase the articles they are in want of. They will go from one place to the other to find out where they can purchase the cheapest. Small makers are the curse of the trade. In the majority of cases these men are simply living from hand to mouth, and are of necessity often compelled to sell at whatever price they are offered. Failing a sale they are compelled to take it to the auction rooms, where it is sold for whatever it will fetch; in many instances it is sold at a loss. This class of makers will go from one timber-yard to another to find out where they can purchase the cheapest. The timber they select is of the poorest description, and which would not be looked at by European makers. The skill that they display in adapting it to their requirements is really wonderful. The main thing with them being cheapness, can it he wondered at that the European cannot compete with, them in the manufacture of these ? CHINESE FURNITURE FACTORIES. 37. The Amending Factories Act, No. 961, requiring the registration of all places where more than one Chinese is engaged working in any handicraft or in preparing or manufacturing articles for trade or sale, has, as will be seen by reference to Appendix D, brought a few more places under control. In 1887, there were 25 factories registered, employing 341 hands ; in '888, there were 40 factories registered, employing 435 Chinese. The increase in the number of hands (94) does not at all represent the employees in the 15 additional factories, but is to be accounted for by the fact that when it was found that by less than six working together the place would still have to register many of them took work in factories that were already registered. 38. With the exception of two, all the Chinese workrooms are in the city of Melbourne, and are under one inspector (Mr. Ellis). He says, in his report, that a few of the Chinese work by themselves, employing no one, and do not, as a consequence, come under supervision. He goes on to say—" Great difficulty is experienced in making them understand the requirements of the Act, especially in relation to condemned places. They don't mind paying the registration fee, but strongly object to move. The places they occupy are mostly situated at the east end of the city, and are nearly all in a very dilapidated condition. The low rent is, no doubt, a great consideration with them." Every effort has been made to have the workrooms occupied by the Chinese passed by the Local Board of Health under the amended regulations made by the Central Board, but it is most difficult to carry this out. After a place has been condemned as unfit for occupation as a factory, and the occupier made to understand this, he at once disposes of his business to a brother Chinese, forgetting, or, at all events, the new proprietor says he forgot to tell him, that the premises had been condemned. The new man naturally asks for a little time to find another place, and when he sees that official patience is about exhausted transfers to some one else. At the same time, the places they occupy compare favourably with the poorer habitations in the city, and there is not much fault to find with them as far as the Factories Act is concerned. 39. Inspector Ellis reports that the Chinese have participated in the general prosperity of the country during the year, and have been quite unable to meet the demand made upon them. He also says—" There is a very marked improvement in the cabinet work they turn out. Two or three years back almost any one could detect Chinese work, but now many of the shops turn out work that it would take an expert to distinguish from European manufacture. They have a society of their own, the terms of membership being, for makers £3 per annum, polishers 30s. They have two holidays during the year, at which there are feasts, and all who have paid their subscriptions are entitled to attend. No union shop can employ any of their hands more than ten hours a day, but this does not apply to piece-workers. Should any dispute arise between master and man, a meeting is called, and the subject debated, the one who gets the best of the argument gaining the case. All decisions are accepted as final." 40. There would not appear to be any actual increase in the number of Chinese working at furniture making, and so long as the present law against the influx of Chinese exists it is difficult to see how there can be. Indeed, it should rather fall off, as when the Chinese have made a little money they are always too glad to return to their native country. Formation largely hierarchical but some possibly proto-Capitalist?? ?